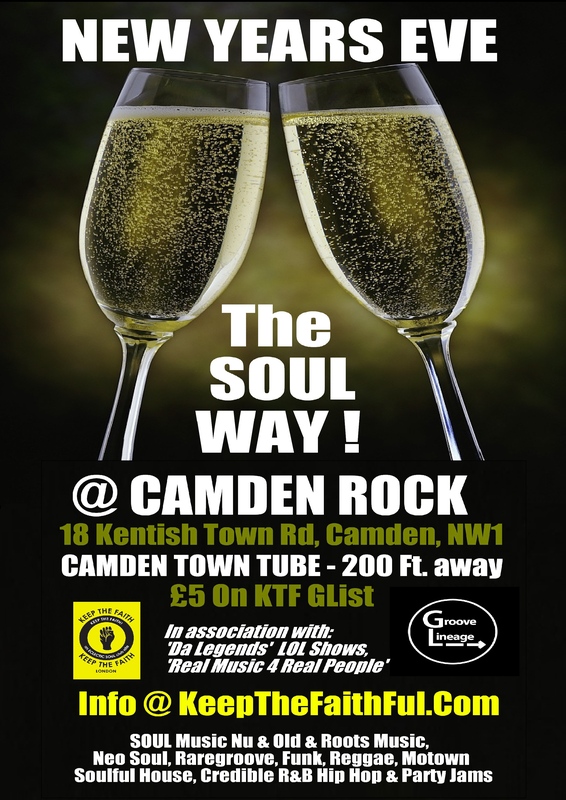 Nearest Transport: Camden Town Tube(200 feet away); ….. 8pm-4am; ….. A Reliable New Years Eve SOUL Party – GROOVE LINEAGE NYE SOUL party now in it’s 5th year running in London. …. £5 all night on KTF Guestlist, £10 non guestlist – email keepthefaithful@gmail.com for guestlist. This informal good vibes party with SOUL music as it’s backdrop takes place in London each year taking pride in it’s cosy atmosphere, friendliness. A decent size dance floor & sound system, with private chill out balcony area with private bar & smoking area. Suitable for those wishing to avoid the cattle market of the bigger clubs found in the West End, Shoreditch etc. A whole range of Soul & related Roots music with live instruments & surprises also lined up. ‘Groove Lineage NYE’ is a reliable NYE Soul event now in it’s 5th year running. £5 on KTF guestlist – email for guestlist, non guestlist: £10, no ticket required. Camden Town Tube (Kentish Town Rd exit) – Only 200 feet away. Landmark: Camden Rock is next to a mini cab office. Off-street parking near by after restrictions end. STARVUE “BODY FUSION” http://www.youtube.com/watch?v=ubvsKR-Gn7A+ more classic SlowJams & 2steps like this! JODECI “GET ON UP”: http://www.youtube.com/watch?v=qfa7cDwJBfU + More quality R&B like this..
SLY & THE FAMILY STONE “FAMILY AFFAIR“: http://www.youtube.com/watch?v=a8Uzikag7Xo + More Funk & Soul like this..
CHAKA KHAN “I FEEL FOR YOU”: http://www.youtube.com/watch?v=ObjLb6ElTvs + more 80’s Soul like this..
Update: KTF NYE GLIST IS NOW CLOSED. PRICES FOR TONIGHT DEC 31st 2011: KTF GLIST £5, NON GLIST £10, Please arrive early, this will reach full cap after which it will be ‘1 out, 1 in’ on the door til it calms down after 2am. Posted in 1980s, 1990s, 2011, 9th-Wonder, A.L, A.L.-&-STUTTA, ACID-JAZZ, Afro, Afro-Funk, Afro-Hair, Afro-Symphony, AMY-WINEHOUSE, ANDWELE-G, Angie-Stone, Anthony-David, Anthony-Hamilton, Artful-Dodger, Badu, Be-Bop, Blackalicious, Blog, Blogger, Blogging, BNH, Boom-Bap, Brand New Heavies, BRIT-FUNK, Brit-Soul, BRITISH-SOUL, CAMDEN, Camden-London-Soul-New-Years-Eve-Saturday-December-31st-2011, Camden-New-Years-Eve-Saturday-December-31st-2011, Camden-Rock, Camden-Rock-NW1, Camden-Town, Camden-Town-NW1, CamdenRock, Carmen-Rodgers, Cheap-Entry-London-New-Years-Eve-Saturday-December-31st-2011, Clubbing, Common, D'Angelo, Daru, Dilla, DJ Jazzy Jeff, DJ-PAUL-AAARON, Dreads, DWELE, DWELE-G, ELISHA-LA'VERNE, Eric-Roberson, Erykah-Badu, ErykahBadu, Events, F-E, Floetry, Flying-Lotus, Free-Entry, Free-Give-Aways, Funky-House, Fusicology, GILLES-PETERSON, GList, Good-People, GOSPEL, GrooveLineage.Com, Guest-List, Guest-List-London-New-Years-Eve-Saturday-December-31st-2011, HEIDI-VOGEL, Hi-Tek, Hidden-Beach, Highbury-Corner, HIP-HOP, Hip-Hop-Jazz, IMPROVISING, Incognito, India-Arie, Islington, J Dilla, Jaguar Wright, Jam, JAMIROQUAI, JAMMING, Janelle-Monae, JAZZ-CAFE-LONDON, JAZZ-DANCE, Jazz-Poetry, JAZZCAFE, Jean Grae, Jesse-Boykins-III, Jill Scott, John-Legend, Jose-James, JOSEPH-JUNIOR, Julie-Dexter, JulieDexter, K15, KEEP-THE-FAITH-EVENTS, KEEPTHEFAITH, KeepTheFaithEvents.Com, KeepTheFaithFul.Com, Kenny-Dope, KetchAVibe, KTF, Ledisi, Leela James, Linda Muriel, Listings, Little Brother, Live-Instruments, LONDON, London-New-Years-Eve-Saturday-December-31st-2011, London-NYE, London-NYE-Soul, Lounge, Marsha-Ambrosius, MAW, Maxwell, Meshell Ndegeocello, money-save, Mos Def, Music-Lounge, Musiq-Soulchild, N'Dambi, N1, Natural Hair, Natural Lounge, Neo-Soul, Neo-Soul-1st-Saturdays, Neo-Soul-Club-Night, Neo-Soul-Gigs, Neo-Soul-Info, Neo-Soul-London, Neo-Soul-London-Night-Club-Events, Neo-Soul-Lounge, NEO-SOUL-World-Wide-Live-Series, NEO-SOUL-WORLDWIDE-LIVE-SERIES, NEO-SOUL-WW, NeoSoul, NEOSOUL1stSATURDAYs, NEOSOUL3rdFRIDAYs, NEOSOULWW, New-Years-Eve, Night-Club, NS1S, NU-JAZZ, NU-SOUL, NUSOUL, NW1, NW1-New-Years-Eve-Saturday-December-31st-2011, NYE, NYE-2011, NYE-2011-2012, NYE-2012, NYE-LONDON, NYE-London-Soul, NYE-UK, Oddisee, okay-player, Omar-Lyefook, On-Sale, Outcast, OUTKAST, P-A, PA, PAUL-AAARON, Pauline Henry, Pharoahe Monch, Phonte, Platinum-Pied-Pipers, Porsche-Smith, PPP, Puzzle-Media-and-marketing, QTip, Quest-Love, R&B, RADIO, Raheem-Davaughn, Recommended, Reduced-Price-London-New-Years-Eve-Saturday-December-31st-2011, REGGAE, Reggae-Britania, Revivalist, RjD2 & Aceyalone, Sa-Ra, Scratch, Selina-Campbell, SOUL, Soul-Britania, Soul-Clubs-London-New-Years-Eve-Saturday-December-31st-2011, Soul-Events-In-London-New-Years-Eve, Soul-Events-In-London-New-Years-Eve-Saturday-December-31st-2011, Soul-II-Soul, Soul-Nights-London-New-Years-Eve-Saturday-December-31st-2011, Soul-NYE-London, Soul-Party-London-New-Years-Eve-Saturday-December-31st-2011, Soulfood-Media, Soulful, Soulful-Hip-Hop, Soulful-House, Special-Offers-London-New-Years-Eve-Saturday-December-31st-2011, Specialist-Music, SPOKEN-WORD, STUTTA, Sunshine-Anderson, Sy-Smith, SyberSpace, Talib Kweli, TALKING-LOUD, The Brand New Heavies, The Chimes, the jazzyfatnastees, THE-FOREIGN-EXCHANGE, The-Light-Of-The-Sun, The-Roots, TV, UK, UK-Garage, UK-GOSPEL, UK-HIP-HOP, UK-REGGAE, UK-SOUL-JAM, UKG, UKGarage, UKSOUL, UKSOULJAM, Uncategorized, VALERIE-ETIENNE, Website, What's-On, Whats-On-In-London, win, Wine-Lounge, Wookie, ZO! BOX OFFICE, IN PERSON & CASH PAYMENTS: To order in person or for Cash payment at JAZZCAFE( front door) box office 5 Parkway Camden, NW1 (Mon – Sat 10.30am-5.30pm). Keep The Faith are delighted to host a UKSoulJam / NeoSoulWW show special featuring Julie Dexter, former Soul II Soul front lady & now a stable part of the USA’s Nu Soul scene. Julie will be performing her critically acclaimed new album “New Again” for the first time in Europe. Also on the night our taste maker new acts to watch, the freshest the UKSoul scene has to offer live. At the end of the night the stage is opened up to the public for an Open Mic Jam – previous guests include Amy Winehouse, Marsha Ambrosius, Jeffrey Daniel of Shalamar – so keep your eyes peeled for those infamous surprise guests & email keepthefaithful@gmail.com if you want to perform. This show is a must for UKSoul & NeoSoul fans. With strong support from our favourite poet Greeds, acoustic Soul-Jazz from Louise Golbey an every popular UKSoulJam artist seen most recently this year with George Benson, Jazz FM & Ronnie Scotts, & another popular UKSoulJam performer – the explosive Nu Soul & R&B of Sharon Rose & making their debut on UKSJ – the NeoSoul of Sturdy. + Our midnight Jam session open to the public at the end of the show. Julie Dexter is a world renowned, award winning, British vocalist considered by many to be one of the most influential female vocalists of our generation. Having shared the spotlight with a host of cutting-edge artists, including Mint Condition, Jill Scott, Bilal, Omar, Loose Ends, Rachelle Ferrell, Ledisi, Eric Roberson and Raheem DeVaughn to name a few, Julie not only holds up her own with them but has been praised and respected by them too. Born and raised in Birmingham, England, this classically trained artist composes and arranges her own music. Influenced by legends such as Nancy Wilson, Abbey Lincoln, and Bob Marley, as well as popular icons Omar and Sade, Julie takes classic soul to the heart of Artistry. Fans and critics across the globe have followed her journey through the circles of Jazz, Broken-Beat, Bossa-Nova, Reggae, Afro-Beat and Soul. Her dynamic voice was first heard in 1994 on “The Jamaican Beat” Vol 1 with Jazz Jamaica then later in 1997 on Dune Records’ release of J-Life, a European Jazz quintet formed by Gary Crosby and led by Jason Yarde. She later toured several continents with Jazz legend Courtney Pine as the lead vocalist for his ensemble. It was in 1999 that Julie took a leap of faith and moved to Atlanta, Georgia where she now resides. She launched her own label, Ketch A Vibe Records and in 2000 released the critically acclaimed EP Peace of Mind, followed by Dexterity (2002) , and Conscious (2005). Moon Bossa, a collaboration with Khari Simmons was released in 2007 and her single “Ketch A Vibe” was featured in national radio ads for Democratic Presidential Candidate Senator Barrack Obama. From Jazz to World Music, Soul and beyond, Julie Dexter is one of an elite few whose talent can transcend genres. She makes it all work on her own terms, as an audaciously independent artist with an undeniable connection to her audience. Julie’s new album ‘New Again” was released in April 2011 to great critical acclaim – available from all good music stores now. “UK SOUL JAM”: A celebration of UK SOUL in an Open Mic – Jam Session, Showcase & DJ Session featuring the best of London’s Soul talent at Jazz Cafe. As seen on Sky TV. UK Soul Jam captures the energy and musical talent from London’s Contemporary Soul Scene. Bringing together singers, players, & connoisseurs of Neo Soul, Nu Jazz, Credible Hip Hop and RnB, Brokenbeat, Reggae, Gospel and Soulful House scenes in London. A platform for new & established artists. Open Mic / Jam is open to the public. “NEOSOULWW” – bringing USA & International Nu Soul acts live to Jazz Cafe, London. office 5 Parkway Camden, NW1 (Mon – Sat 10.30am-5.30pm). UK SOUL JAM: A celebration of UK SOUL in an Open Mic – Jam Session, Showcase & DJ Session featuring the best of London’s Soul talent at Jazz Cafe. As seen on Sky TV. UK Soul Jam captures the energy and musical talent from London’s Contemporary Soul Scene. Bringing together singers, players, & connoisseurs of Neo Soul, Nu Jazz, Credible Hip Hop and RnB, Brokenbeat, Reggae, Gospel and Soulful House scenes in London. A platform for new & established artists. Open Mic / Jam is open to the public. Posted in 1980s, 1990s, 2011, ACID-JAZZ, Afro, Afro-Funk, Afro-Symphony, AMY-WINEHOUSE, Angie-Stone, Anthony-David, Anthony-Hamilton, Badu, Blog, Blogger, Blogging, Bluey, BNH, Boom-Bap, Brand New Heavies, BRIT-FUNK, Brit-Soul, BRITISH-SOUL, CAMDEN, Carmen-Rodgers, CDs-For-Sale, CECILIA-STALIN, Choirs, CHROMATONE, CK Band, Clubbing, Common, competition, D'Angelo, Dates, De'Borah, DEBUT, Dilla, DJ Jazzy Jeff, DJ-KAY, DJ-Kay(K15), DJ-PAUL-AAARON, DWELE, ELISHA-LA'VERNE, Eric-Roberson, Erykah-Badu, ErykahBadu, Events, Floetry, Flying-Lotus, Free, Free-Entry, Free-Give-Aways, GILLES-PETERSON, GREEDS, GRIME, GrooveLineage.Com, HARLANO, HEIDI-VOGEL, Hidden-Beach, HIP-HOP, Hip-Hop-Jazz, IMPROVISING, Incognito, India-Arie, J Dilla, Jaguar Wright, Jam, JAM-SESSION, JAMIROQUAI, JAMMING, Janelle-Monae, JAY-KAY, Jazz Bailey, JAZZ-CAFE-LONDON, JAZZ-DANCE, Jazz-Poetry, JAZZCAFE, Jesse-Boykins-III, Jill Scott, John-Legend, Jose-James, JOSEPH-JUNIOR, Julie-Dexter, JulieDexter, K15, KEEP-THE-FAITH-EVENTS, KEEPTHEFAITH, KeepTheFaithEvents.Com, KeepTheFaithFul.Com, KTF, Launch-Party, Leanne Robinson, Ledisi, Leela James, Linda Muriel, Listening-Session, Listings, Little Brother, LIVE, Live-Instruments, LONDON, Lounge, Marsha-Ambrosius, Max-Roach, Maxwell, Mishal-Moore, Music-Lounge, Musiq-Soulchild, N'Dambi, Neo-Soul, Neo-Soul-1st-Saturdays, Neo-Soul-Club-Night, Neo-Soul-Gigs, Neo-Soul-Info, Neo-Soul-London, Neo-Soul-London-Night-Club-Events, Neo-Soul-Lounge, NEO-SOUL-World-Wide-Live-Series, NEO-SOUL-WORLDWIDE-LIVE-SERIES, NEO-SOUL-WW, NeoSoul, NEOSOUL1stSATURDAYs, NEOSOUL3rdFRIDAYs, NEOSOULWW, Night-Club, NS1S, NU-JAZZ, NU-SOUL, NUSOUL, NW1, Oddisee, okay-player, Omar-Lyefook, On-Sale, OPEN-MIC-JAM, OUTKAST, P-A, PA, PAUL-AAARON, Pauline Henry, Platinum-Pied-Pipers, Porsche-Smith, PPP, QTip, Quest-Love, R&B, RADIO, Raheem-Davaughn, REGGAE, Reggae-Britania, Revivalist, Sa-Ra, Selina-Campbell, SOUL, Soul-Britania, Soul-II-Soul, Soulfood-Media, Soulful, Soulful-Hip-Hop, Soulful-House, Specialist-Music, SPOKEN-WORD, STUTTA, Sunshine-Anderson, SURPRISE-GUESTS, Sy-Smith, SyberSpace, Talib Kweli, TALKING-LOUD, The Brand New Heavies, The Chimes, The CK Band, The Coup, THE-FOREIGN-EXCHANGE, The-Light-Of-The-Sun, The-Roots, TV, UK, UK-Garage, UK-GOSPEL, UK-HIP-HOP, UK-REGGAE, UK-SOUL-JAM, UKG, UKGarage, UKSOUL, UKSOULJAM, Uncategorized, VALERIE-ETIENNE, Website, What's-On, Whats-On-In-London, win, Wine-Lounge, Wookie, ZO!